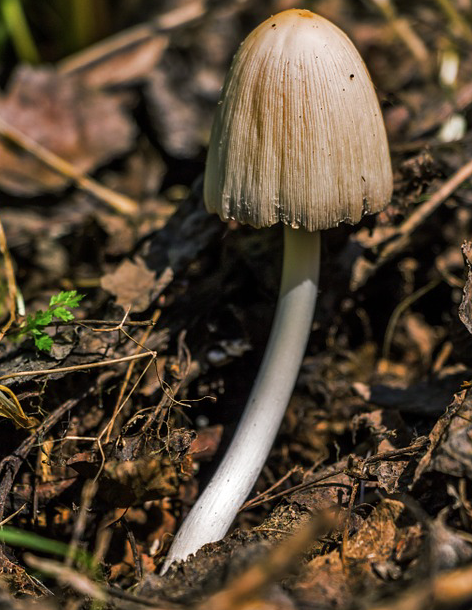 Coprinus comatus or more commonly known as the Shaggy ink cap, Lawyers wig and Shaggy mane is a choice edible mushroom if picked early enough (before auto digestion occurs). If I'm honest i was not a really a fan when i first tried them as they just ended up being a slimy mess on my plate, however i have persevered with them and I'm glad i have. By cooking slower and longer they turn into a flavoursome treat and are great after pre cooking being dipped in a temupa batter and quickly fried! This mushroom can grow in a variety of different locations including verges, open woodland, adjacent to paths but are more commonly found in open grassland especially if the area is irrigated. Don't let the scientific name put you off this mushroom. Coprinus is derived from Greek and means of dung. comatus is derived from Latin and simply means hair or long haired. The mushroom appears from the ground like a long cylindrical egg and can get to around 20 cm tall so are easy to spot, you do have to be fairly quick to pick and eat them as the start to auto digest in a very short period of time. The Cap: The cap when mature can range in size from 3cm-7cm in width and 5cm - 15cm in length. When newly emerged is ovoid in shape, as the mushroom emerges further it becomes quite long and ellipsoid and finally bell shaped with upturned margins as it auto digests itself ( see pic above). If the mushroom dries out during warm weather the outer surface starts to crack and peel giving the mushroom a hairy appearance. The Gills: The gills are crowded and annexed-free. There are three distinct colours of the gills as the mushroom ages, first the gills are white as it emerges from the ground, as the mushroom matures they turn from white to pink in colour and finally in the last stage as the mushroom auto digest they turn black. The Stem is usually around 5cm-30cm long and 1cm-2cm wide, cylindrical in shape,hollow and smooth to touch. Although Shaggy ink caps are very distinctive looking mushrooms when they are young they can be confused with Coprinopsis atramentaria. Although considered edible, poisoning can occur if alcohol is consumed before and after eating due to coprine blocking the breakdown of methanol which is the byproduct of ethanol.